The key selling point of a “Donald Trump presidency” was that a “successful businessman” such as himself would know how to run the U.S. government efficiently. “I know all the best people”, he told adoring fans. “I’m worth $10 Billion dollars” he told the masses. And because of his success as a businessman, he supposedly would be able to run this massive “corporation” we now call The Federal Government (never mind the fact a government isn’t a corporation.) Trump claimed at the very start of his campaign that… because of his fantastic wealth… he “couldn’t be bought” and would only work in YOUR best interests, not those of the “Special Interests”. He would “take no money” from those same “Special Interests” and run a “self funded“ campaign using his own money to run for president. But in fact Trump did NOT self-finance his campaign. When he DID spend his own money on his campaign, it was only a loan where he charged his own campaign to pay him back. Even then, Trump wasn’t even the biggest donor to his own campaign. No “Special Interests”? He had multiple “SuperPACs” pouring money into his campaign as well, and as I posited two weeks ago, there is a trail of laundered Russian money leading to Trump’s back pocket like a trail of breadcrumbs. And despite all of Trump’s innuendo regarding money pouring into “The Clinton Foundation” and whether or not some of it was making its way to the Clinton campaign, Trump repeatedly refused/refuses to release his tax returns (no, this is not about Trump’s taxes) on the grounds he was “under audit” (which was NOT preventing him from from doing so) yet promising “as soon as the audit is over, I’ll release them.” But even after the election was over, Trump continued to refuse to release his taxes. And once he was sworn in and no longer under audit, he argued his taxes “no longer mattered”… “nobody cares except the sore losers”. Trump’s tax return for 2016… the year AFTER the one that was audited… the year he was running for president… was NEVER under audit, yet he never released that year either (nor were his tax returns for ANY other prior year.) To this day, we have never seen Donald Trump’s tax returns. Why? What doesn’t he want us to see? Then there is the question of “Emoluments” and whether Trump is using the presidency to make himself rich. Any time the subject of “money” comes up regarding Trump, it suggests he’s desperately trying to prevent his “true wealth” from becoming public knowledge. And the braggart & raging egomaniac that Trump is, does anyone think if he was even more fantastically rich than he has publicly claimed, that he wouldn’t be tweeting it from the rooftops? Of course he would! Trump’s entire shtick is that he is qualified purely due to being a business & financial success. So, what if it turns out he isn’t? After filing four bankruptcies, two divorces, being sued multiple times (settling his “Trump University” fraud case for $20 Million dollars rather than continue fighting), closing failed casinos, and a list of failed businesses longer than my arm, how does one suffer SO much failure and expense, and still be worth over $10 Billion dollars? Simple… he isn’t. He’s deep in debt and owes some very powerful people a lot of money. …But he can’t admit it without being exposed as the lying Snake Oil salesman he is and disappointing his legions of “poorly educated” fans. 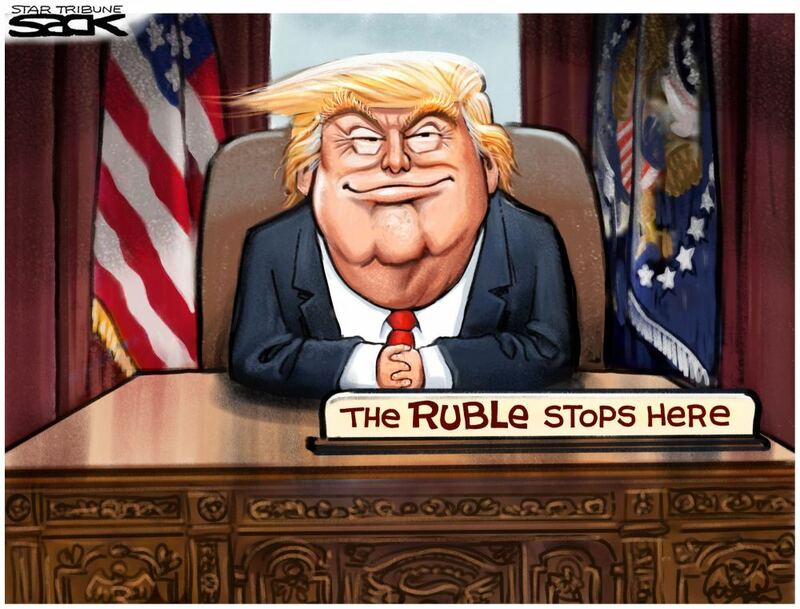 As I stated above, there is a troubling record of Russian money finding it’s way into Trump’s campaign coffers to the point I no longer have ANY doubt the Russian government… by way of well-connected Russian oligarchs… bankrolled the bulk of Donald Trump’s political campaign. From the Russian fertilizer magnate who paid 2-1/2 times the value for a Florida mansion belonging to Trump… sight unseen… just as Trump was being forced to pay a multi-million dollar judgement against him… only to have the property demolished without the new owner having ever visited it even once, and sold for a $60 million dollar loss… to the private computer server in the Trump Tower campaign headquarters with a dedicated hotline connection to a Russian bank, to millions in laundered Russian Mafia crime money poured into Manhattan real estate purchased from Trump (no questions asked)… Trump owes much of his wealth to (criminal) Russian investment. Immediately after his inauguration, Trump doubled the membership fee to his “Mar-a-lago” Resort from $100,000/yr to $200,000/yr. The rich & powerful… those “Special Interests” Trump bemoaned… were buying up memberships hoping to hob-knob with The President himself. But Trump wasn’t about to divest himself of his prized resort in which the wealthy could rub elbows with the Commander-in-Chief himself if the price is right, nor did Trump set any rules against “unsolicited fraternization”. If you’ve got the bucks, you might just luck into a private meeting with The President of the United States. What percentage of Trump’s “regular Americans” do you think he’ll run into down there at that price? We know that as a real estate mogul in NY, Trump had a history of not paying his workers/suppliers/vendors, and he suggested during the campaign that only dumb people pay taxes, so much of Trump’s wealth came from being a deadbeat… something he can no longer get away with as president of the United States. I mentioned above that Trump only LOANED his own campaign money to finance it, but we also learned just last week that Trump blatantly overcharged the Secret Service to rent space in Trump Tower to provide security for his wife & son Barron while they lived in New York. To charge them anything at all to stay in a hotel HE OWNS when they are there purely to protect him & his family when in New York is bad enough, but to scam the American taxpayers to pay double the normal rent to do it? Does he REALLY need the money THAT bad? Also breaking news last week, not only did Independent Council Bob Mueller impanel a Grand Jury to hear evidence connecting Trump to Russia, we also learned Mueller is “investigating Trump’s personal & business finances”… not just campaign finances as they may relate to the Russia investigation. Trump is reportedly very angry about this. Why would Mueller be investigating Trump’s “private” finances as part of his Russia investigation? Because, like me, Mueller also believes Trump’s businesses were used to launder Russian crime money into his presidential campaign. Republicans have pined for a “CEO president” for 20 years. It was part of their sales pitch for Bush & Cheney in 2000 (touting their “CEO” credentials.) Bush had a string of disastrous business failures behind him (requiring bailouts from Daddy’s friends) while Cheney bilked the government for Billions as a government contractor. THAT was their record as “businessmen”. And one might think that the disastrous Bush/Cheney presidency would have soured Republicans on the idea of electing another “CEO President” promising to run the country “like a business”, but they did it again with Donald Trump. And once again we find another failed businessman who’s really good at scamming people, declaring bankruptcy and asking Uncle Sam for a bailout. So look at the list of financial matters connected to the Trump campaign: He refused/refuses to release his taxes… the first to do so since Nixon. He charged his own campaign to reimburse him for all the money he loaned it, he over-charged the Secret Service rent to protect his own family in his own hotel, he also doubled the Mar-a-Lago Membership Fee, there is all the Emoluments/profiteering off his business interests that he refuses to divest himself from, there’s his four bankruptcies, two divorces and failed casinos, has bragged about paying no taxes (not just the wealthy, but people deep in debt also pay no taxes), legal judgements totaling MILLIONS against him, a string of failed business ventures including “Trump University”, which turned out to be one giant scam, and a Russian-cash expressway between the Kremlin and Trump’s real-estate holdings around the world. That blue “TRUMP” 707 he flew around in during the campaign is all that’s left of “Trump Airlines” that was born & died in the late 1990’s. For a man supposedly worth $10 Billion dollars, he sure seems to be nickle & diming the Federal government while spending very little of his own money (as I write this, I’m noticing how Trump nor his Wife & son, have ever vacationed any place Trump didn’t already own (either Trump Tower in NYC or Mar-a-Lago in Florida). Every time a Republican calls for “Running government like a business”, point out to them that businesses are NOT Democracies. They are “Dictatorships” or “Monarchies” run to turn a profit. Governments are services that SPEND money to provide those services. THAT is what we pay taxes for! Trump himself once said: “In government, every decision requires you to have a heart. In business, it’s the opposite. In fact, it may be better if you have no heart at all.” And this is whom they elected to run the largest public service on the planet. Businesses are run to make a profit for the CEO and pay off shareholders. Who know who Donald thinks the CEO is. One wonders whom he thinks his “shareholders” are? Whom does he owe? Who OWNS HIM? ADDENDUM: The day after I wrote this, “The Rachel Maddow Show” actually explored the question of all the money Trump is making off the presidency and its legality. RECOMMENDED VIEWING. UPDATE 9/20/17: Reuters is reporting that the RNC is paying Don Jr’s personal legal bills, and Trump is using his Election & Re-election Campaign funds to pay for his own (and his family’s) legal bills in the Russia investigation. This helps explain why he launched his “reelection campaign” THE DAY HE TOOK OFFICE [ibid]. Trump raised $107 MILLION for his “pre-inaugural concert” (more than TWICE the $53M Obama raised for his 2009 star-studded even) and promised to donate the unused portion to charity. The Trump campaign wildly overpaid $25M on a handful of low budget events including one cover band, highschool marching bands and baton twirlers, then and kept the rest. Trump DID keep his promise to *personally* donate $1 Million to victims of hurricane Harvey (which was split 12 ways), though it bears pointing out that for a man who claimed during the campaign to be worth “over $10 Billion dollars“, a donation of a mere $1 Milion amounts to 1/10,000th of his claimed total net worth… roughly equivalent to a person worth $550K (including home) and $50K salary) donating just $55.